Note 06/06/11: Loose Wheels opened, is still open and has been a notable success. During the 70s and 80s Lucile’s was a honkytonk like no other. Drawing great Texas singers from Gary P. Nunn and Ray Wylie Hubbard to Rusty Wier and Asleep at the Wheel. Tales from those days at the club on Denison’s south Armstrong Avenue. Lucile’s founder Buddy Gray and his wife Jo, along with partners, Wayne McCarley , Dan Reynolds, and Duke Walker, are reincarnating the club as Loose Wheels, Texas. If the word of mouth hasn’t made it your way yet, pull up a stool. The hilltop off U.S. Highway 75 and Spur 503, where the new Cigna headquarters will also call home, has been in Buddy’s possession off and on during the last 30 years. He has been waiting to fulfill the ultimate dream of a restaurant, bar, campground, amphitheater—an upscale biker’s resort, of sorts. Denison leaders call the area the most important for retail development, you wouldn’t know it as you pull into Loose Wheels, Texas. It looks like a backwoods joint, brand new of course, but a joint. By day, Loose Wheels, Texas will be family restaurant, a place to kick back for lunch and early dinner. In the evening it’s grown-ups only with well-known acts in the world of rock, blues, jazz and country. Lu Herrin, the lead singer from the local band Class Act, has been charged with booking the Loose Wheels, Texas stages. On land they call Honey Run Ranch. Phase II of the Loose Wheels, Texas project will include a large outdoor stage and natural amphitheater built into a hillside. Partners plan all-day outdoor concerts and festivals in the amphitheater. There will be sites for vendors to set up along the rim, and places for campers and RVs. Honey Run Ranch will be an extraordinary campground venue right smack dab in between Sherman and Denison. For now, the phase the group is concerned with most is the restaurant, the music, and the bar. The main building features four large roll-up doors that can be opened to allow music from the nearby outdoor stage to entertain the patrons. Large picture windows surround the building. The old tower you see peeking over the trees on that hill is from Perrin Field. Buddy has had it in pieces on the ground for decades, and it was the first structure to go up at Loose Wheels, Texas. The foundation legs of the tower anchored 18 feet into the ground, and the building was built around it. Inside, a bar wraps around the tower’s legs. Atop the bar will be a turntable to display a featured motorcycle. Loose Wheels will be big on barbecue, chicken fried steak, burgers, and the like. The menu will also feature unique dishes accented with green chilies and attitude. Buddy at one time ran a barbecue joint called Fine Urban BBQ, so he knows his way around a brisket. They will be able to smoke hundreds of pounds of meat at one time using two custom made smokers. 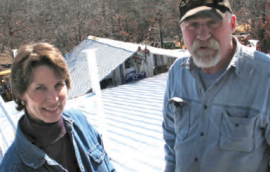 Jo and Buddy Gray on the roof of Loose Wheels. “This is going to be a fun, friendly place where you can come and relax with your friends,” she said. Nearly four years in the making, plans are to open this summer.